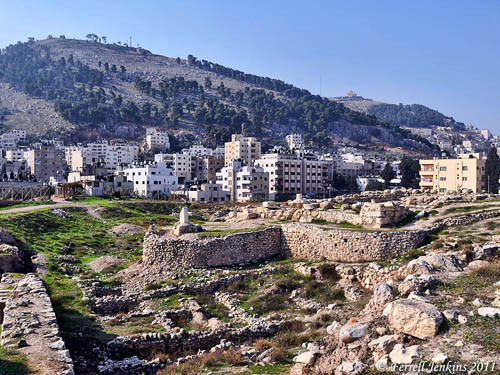 Dutch and Palestinian archaeologists are working at Tel Balata, the site of biblical Shechem, under the auspices of the Palestinian Department of Antiquities. The Associated Press report in Ha’aretz provides a brief summary of archaeological work at the site over the past century. Fox News reports on the excavation here. We wrote about a visit to Shechem, with a summary of the biblical history of the site, here. Other significant posts are listed for your convenience. The Temple of Baal-Berith at Shechem here. The Entrance to the Temple of Baal-Berith here. The Sacred Standing Stone at Shechem here. The photo below was made in December, 2009. 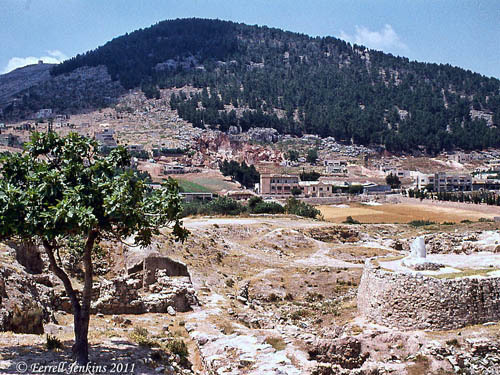 The site of Shechem is in the foreground. Mount Gerizim is in the distance. Notice how the apartment buildings are crowded around the archaeological park. The site was in fairly good condition at the time, but there were no signs marking the ruins. View of Mount Gerizim from Shechem. Photo by Ferrell Jenkins in 2009. Below is a photo I made in 1973. Notice that there are more trees on Mount Gerizim, and fewer buildings around Tel Balata. View of Mount Gerizim from Shechem. Photo by Ferrell Jenkins in 1973. This next photo was made from atop Mount Gerizim in 1982. Ancient Shechem is located near the center of the photo below the line of trees. The location of Jacob’s Well is just out of the photo on the right. 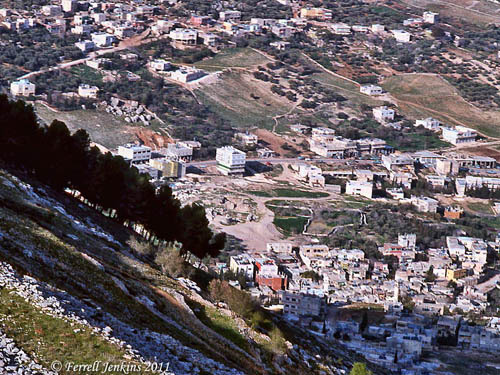 A view of Shechem from Mount Gerizim in 1982. Photo by Ferrell Jenkins. Shechem has never been a very popular stop for tourists. Many will stop to see Jacob’s well without knowing that this important biblical site is just blocks away. We are delighted to know that archaeological work is going on in the West Bank Palestinian territory. HT: Joseph Lauer, Brooks Cochran. This entry was posted in Archaeology, Bible Places, Bible Study, Israel, Old Testament, Photography, Travel and tagged Nablus, Palestinian Authority, Shechem. Bookmark the permalink.